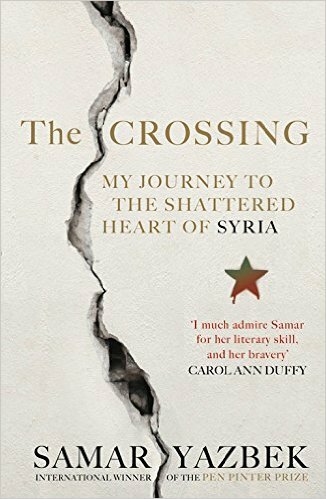 This review of Samar Yazbek’s “The Crossing: My Journey to the Shattered Heart of Syria” was first published at the Daily Beast. Known today only for war, Syria is heir to an ancient civilisation. Idlib province houses the remains of Ebla, a five-thousand-year-old city, and is dotted with half-intact Byzantine towns and churches. The war’s “ruthless sabotage of history” has damaged these priceless sites. In Maarat al-Numan the statue of 9th Century poet Abu Alaa al-Maari, a native of the town highly respected in his own time despite his unusual atheism, has been decapitated by armed Islamists. And the wonderful mosaic museum at the same location has been bombed by the regime and looted by various militias. Samar Yazbek was forced to leave her home in Damascus in July 2011, four months into the popular uprising “for rights and dignity”. “Woman in the Crossfire”, her moving narrative of that period, contains the eyewitness accounts of protestors, conscripts and defectors from a wide range of backgrounds. In “The Crossing” she returns as novelist more than journalist, precisely registering physical and psychological details, drawing telling character sketches, and evoking the surreal terrors of a world tipped upside down. But she’s an activist first of all, helping on these trips to establish Women’s Centres throughout the Syrian north (part-funded by her Soriyat for Development charity) to “resist the radicalisation of society through education and economic empowerment.” Doing this she meets female activists, war widows, women whose sons have been dragged from their arms to be shot, and impoverished girls who see no option but to marry much older men. She provides intelligent commentary on how the violence marginalises women but also (by making them the chief bread-winners) increases their responsibilities and (sometimes) their independence. By her final visit, in July and August 2013, the checkpoints are as often manned by Iraqis and Mauritanians as Syrians. Decapitations have become common. She is present (protected only by a veil and a wall) when Polish journalist Martin Soder is abducted by ISIS. Syrian horrors and hopes almost defy description. Samar Yazbek’s passion and literary skill somehow manage to do them justice.